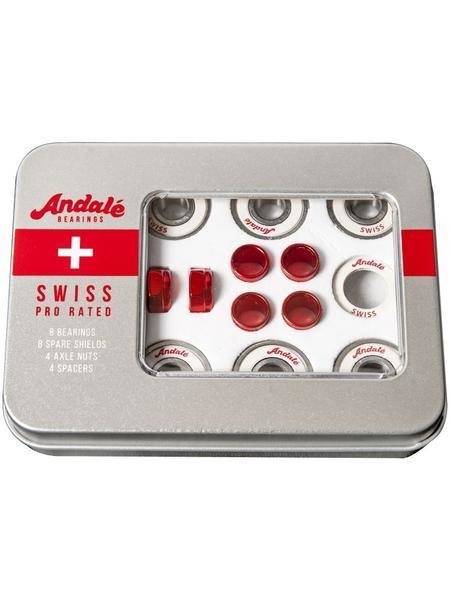 New Andalé Swiss Bearing Kit White / Red Features: · Set of 8 Bearings, 8 replacement shields, 4 Bearing Spacers, and 4 axle nuts all in a custom tin box. · High precision grade 5 chrome steel balls for maximum speeds. · Precision-polished chrome steel races reduce friction and increased speed. · synthetic oil lube reduces friction and protects against corrosion. · Inner race locks shield to provide a barrier and keep bearings cleaner. · Non-contact removable rubber shield designed for minimal resistance. · Manufactured with Swiss precision and quality. The New Andalé Swiss: Not all bearings are created equal. 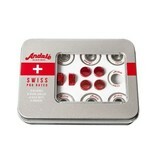 Andale ProRated Swiss were designed and engineered in Switzerland and are manufactured at its factory in China. What makes the ProRated Swiss so good? It starts with using a superior quality chromium steel alloy for the balls and races precision machined and polished to a surface roughness below 0.1 microns. The smoother the polish means less friction for quicker acceleration and a higher top speed. Balls are rated by their grade. Andale Pro Rated Swiss use grade 5 which means the balls have a 5/1,000,000 of an inch tolerance of being a true sphere. This perfection also decreases friction to reduce internal wear and again maximize speed and acceleration. The cage was engineered to withstand all abuse from skateboarding. Because the cage is a crucial component to maximize durability and protect a bearing from failure, it not only had to be strengthened in critical areas but a proper material blend of nylon and fiberglass had to be determined. The ProRated Swiss uses a removable frictionless rubber shield for easy cleaning. And to achieve the best performance from a bearing, it’s imperative to keep them free of dirt and debris. The inner race has a step machined in it so the rubber shield overlaps to keep the oil in and keep dirt from getting into the bearings increasing wear and reducing speed. The bearings are lubricated with specially-formulated synthetic oil that adheres to the components in a thin layer for protection against wear and corrosion. The ProRated Swiss was built for maximum speed.